Instagram has been steadily building up its online shopping tools, and now the photo-focused social media platform has its own shopping cart. On Tuesday, March 19, Instagram launched a checkout tool, allowing users to both shop and then go through checkout without ever leaving the network. The feature is rolling out in the U.S. in beta today with a handful of businesses. Instagram checkout works with existing tools like shopping tags and stickers inside both feed posts and Stories. 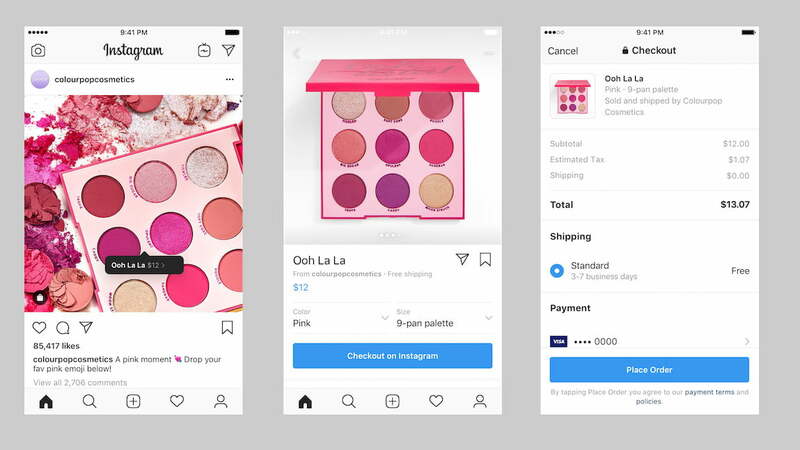 The product page for items from early adapters of the new tool displays photos, allows users to choose different options like sizes and color, and then includes a “checkout on Instagram” button. Instagram says checkout information will be “securely saved” for future orders, streamlining the process for second purchases, even from a different retailer. Once checkout is completed on Instagram, the network tracks the order, sending delivery updates right inside of Instagram’s notifications. The tool will also have an option to make a return, cancel an in-progress order, or request support. Instagram says the platform now has 130 million users tapping on product tags every month, the result of a series of shopping-focused updates. Along with adding the shopping tags and stickers, Instagram added features to allow users to save products, along with a spot in Explore dedicated specifically for products. Expanding shopping on Instagram comes as parent company Facebook is seeing increasing criticism for a platform profiting on user data through targeted ads. Mixing social and shopping could serve as an alternative method for the company to bring in some cash, after CEO Mark Zuckerberg shared a vision for a more privacy-focused Facebook. At the same time, Instagram is asking users to save payment information as Facebook is increasingly scrutinized over privacy practices. A handful of partnerships helped launch the new checkout tool, including a partnership with Paypal, one of the payment options. eCommerce platform BigCommerce is also an early partner for the tool, enabling businesses to make Instagram transactions. While the tool is live with several fashion, beauty, and athletics retailers, the tool is still in beta. Business owners can apply to be part of the beta program online.